Have small pockets for ice pack in the back. An insulated bladder pocket that keeps your water cold. Made of 30D fabric and microfiber mesh. Straps are easily adjusted but with minimal stretc. A water reservoir for 2.5L. Biostretch Body Wrap harness hugs the pack to the body. DigiFlip Media Pocket for smartphones. One of the single most important aspects of successful and safe long-distance running for sport or fun outdoors activities is some extra hydration. Runners of all types, from marathoners to trail runners, can quickly become dehydrated even if they are trail running in cool weather. Dehydration is a serious health concern and in extreme cases will require hospitalization. Hydration packs offer runners a way to comfortably carry water and get a drink with minimal effort to stay hydrated. Hydration packs are also called hydration bladders, water packs or are referred to as Camelbaks though the latter is actually a brand. Hydration packs are a fairly basic piece of equipment and look very much like a small, slim backpack. The inside of a hydration pack is a watertight “bladder” which holds your water. You access the water through a straw-like tube that has a mouthpiece on the end of it. By biting and sucking on the tube like a straw you can drink. It’s easy! Hydration packs come in a variety of storage space, though 2 to 3 liters of water tends to be the most versatile size. Some brands offer two pack designs, either for women or men, so you can be assured that you’ll be able to customize the straps on your pack for your anatomy. High-quality hydration packs literally feel like part of your body and should not bounce around when you are trail running. Many packs also contain pockets so you can carry energy bars, your phone, maps, music device, and an extra small first aid kit. There is much debate in the running world when it comes to the controversy of hydration packs vs handhelds water reservoir. Bottles, or handhelds, are the old stand-by when it comes to keeping hydrated while running and for that reason, some people refuse to use hydration packs. If you are a die-hard handheld or bottle belt user, you might find that a hydration pack is much easier. Many runners cite that they feel freer and with less weight after switching to a hydration pack. Since the pack is located against your back you are naturally able to carry the weight more easily. With your hands-free, you are also able to eat while trail running or hiking, look through your GPS or map and anything else you need to do where you’d normally need to stop since your hands are full. There are some advantages of bottles over packs but they can easily be fixed. One is that the sight of your bottle and seeing the water level can encourage you to drink. Since you can’t see your hydration pack you may forget to drink. This issue can be remedied by setting alarms on your watch or mobile device to remind you to drink at regular intervals. Another benefit of bottles is that you can easily carry non-water beverages whereas you can damage a hydration pack by doing so, especially with sugary drinks. If you feel you must have a sugary drink or a sports drink on a particular run, you can carry a separate small bottle for that. There are so many different hydration packs on the market that it can be overwhelming to choose one. Save yourself the stress by choosing one of these 3 hydration packs specifically designed for runners. 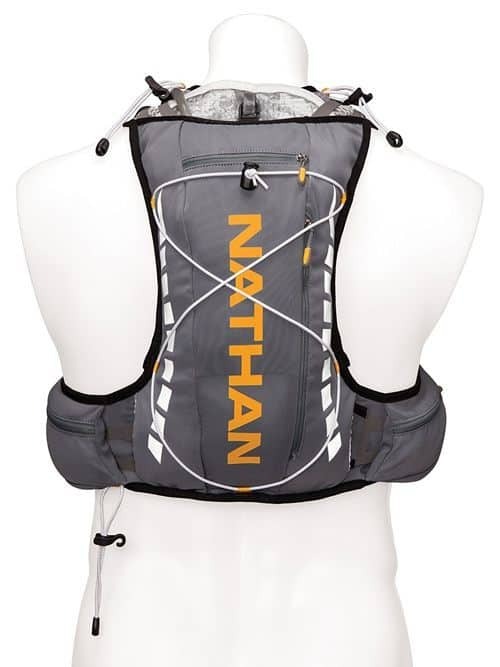 Nathan Sports is a very well-known company in the running world and for good reason. This brand offers some of the best hydration packs on the market. They have packs for all runners, whether you’re a brand new runner with no experience to ultrarunners and marathoners. 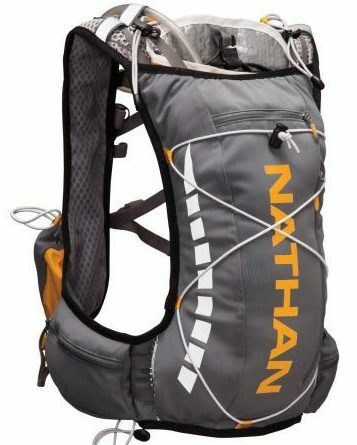 Out of all of the Nathan packs, two really stand out due to their features and versatility: the VaporWrap and VaporShape. The two packs are pretty much identical except the VaporWrap is designed for men while the VaporShape is ideal for women. Both packs carry a 2L bladder but have upwards of 8L of space in the pack for storage or extra water. Your water is kept cool for longer than most other packs due to an insulated bladder pocket. With a properly fitting size, the VaporWrap and VaporShape have literally no bounce thanks to the Nathan Sport Bladder Control System and their Ergo-Response System. Both packs have plenty of storage, both in the pack and on the belt of the pack. If you carry small items with you during runs you will be able to take them hands-free. Another amazing aspect of the Vapor series packs is how they combat heat. A common complaint of runners in warm climates is how hydration packs cause the body to heat up even more. Nathan addressed this concern by adding special small pockets for ice pack in the back of their packs. The packs are already highly breathable so these are a great choice for runners in warm regions. The VaporWrap and VaporShape can both be used with trekking poles and have adjustable elastic cords for carrying poles as well as strapping the pack down. 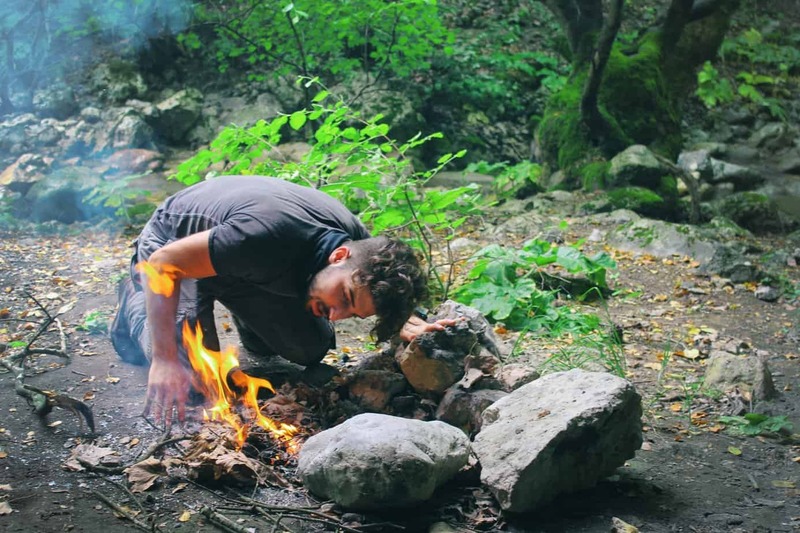 Overall these packs can be used in any situation, even for casual hiking. The VaporWrap comes in one color while the VaporShape comes in two. Both packs are ideal for use in areas where you may come across traffic or if you are running at night as they both have reflectors all around them. If you need a pack that is easy to use, priced reasonably and can be worn in hot weather comfortably, the VaporWrap or VaporShape would be an excellent choice. You can find the VaporWrap here for a good price. Women who find that they get bounce or chafing from packs should have their issues alleviated with the VaporShape since it fits the female form like a glove. UltrAspire is a reputable brand owned by Elite Creators LLC. The UltrAspire team consists of runners and other avid outdoor enthusiasts so their products are personally tested and held to a high standard of quality. Other authorities in the running world back this brand and their packs. 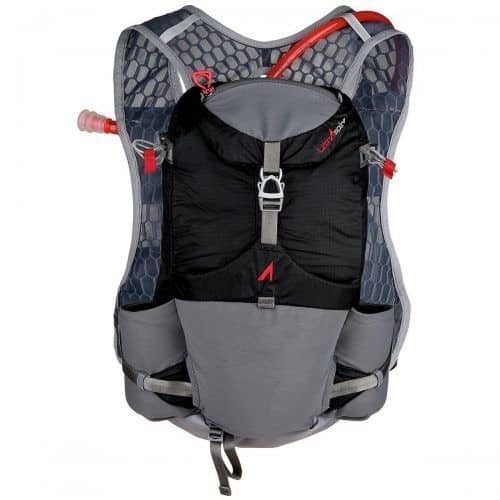 The Omega pack was originally a custom pack created for Krissy Moehl, a well-known ultra trail runner, is one of UltrAspire’s most praised models. The Omega is a gender-neutral pack that fits both women and men extremely well. It is easily adjusted and comes in one size in 3 colors. 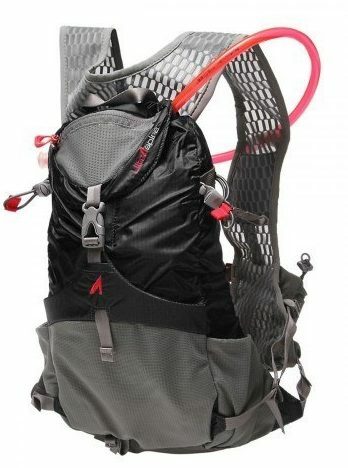 This pack holds 2L of water and is really light weight at under 16.5oz. The Omega is loaded with storage. It has zippered small pockets on the top and right side of the pack. The left side of the pack has a mesh pocket over another small zippered pocket. UltrAspire also included their Magnon Electrolyte pocket which keeps salt tablets and powders in easy reach separate from other items. The whole Omega pack is made of 30D fabric and microfiber mesh which is why the pack is so lightweight as well as breathable. To keep bounce to a minimum, the Omega has Compressi-flex built into the sides so as items are removed or water is consumed, the pack remains compressed. The straps on this pack are easily adjusted but with minimal stretch so it stays in place on your body, even on difficult trails and over obstacles. Overall the UltrAspire Omega is a perfect pack for people running in very hot climates since it wicks away sweat. It is also perfect for competition where time really counts since the pack can be very quickly filled. One downside of this pack is that it only comes in one size. If you are a women with a slim waist it may be difficult to adjust this pack properly. This also can affect petite women or short men. The Omega is best suited for the average-sized man or woman with a slim build. You can find the UltraSpire Omega at this listing. Last, but certainly not due to superior quality, is the Osprey Packs Rev 24. Osprey is a brand that offers a few different outdoors products but primarily focuses on creating some of the best hydration packs at an affordable price. The Rev 24 is no different and known among many running niches as having some of the most comfortable packs. Osprey uses a special belt and harness style system, called Biostretch, on the Rev 24 that is extremely secure but breathable and comfortable for a great fit. 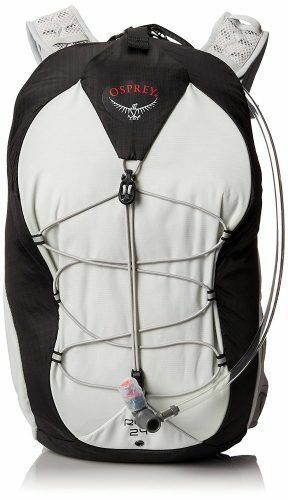 Though this pack isn’t built like a vest, this Biostretch Body Wrap harness hugs the pack to the body, beating many vest-style packs in terms of flexibility. The Biostretch Bodybelt doesn’t chafe the stomach and prevents the pack from moving on the lower back. The Osprey Rev 24 is loaded with space and small pockets, which is one reason this pack is specifically suitable for long distance trail running and hiking. Osprey also incorporated a nifty feature with smartphones in mind: their DigiFlip Media Pocket, to stay hydrated and connected! One unfortunate but common issue with a smart phones is accidentally dropping it while running. This isn’t just a bummer because you’ll have to replace it but also bad news if you were really on a digital map or GPS on the said phone. The DigiFlip pocket securely holds your phone on the left shoulder strap so all you need to do is flip it down, so it will be easy and comfortable to see your screen. If you are a long distance runner, particularly if you participate in trails, mountain biking and other rigorous trekking outdoor activities combined, this Rev 24 will be your best choice. It has a water reservoir for 2.5L of water, which is a plenty amount and is large enough to carry extra bottles, an extra change of clothes, some food bars and more in his lightwight design. The pack comes in only two sizes though petite female runners have said that the small fits them like a glove, unlike many other unisex packs. Check out this listing for pricing on the Rev 24. A high-quality hydration pack can make all the difference in your next run, whether you’re competing or just having fun with a running buddy. If you’ve been wanting an alternative to bottles or just looking for ways to improve your form and time, look into the pros and cons for getting one of the amazing pieces of equipment.